One year ago I wrote the September 2015 update. You can read that here. A lot has happened in the past year. So let's get right to it! With Offworld Trading Company now released as well as Ashes of the Singularity released, the Star Control team has gotten reinforcements. The team is now a who's-who of some of the most experienced game developers in the industry. Broadly speaking, the Star Control team is made up of the leads of Civilization IV, Civilization V, Galactic Civilizations and numerous other classics. Never before have I worked with a team with this much experience. So many people love Star Control and want to bring it back. Star Control is an immensely difficult technical challenge to do today. You really wouldn't think that given that 24 years ago, Star Control 2 was done as a DOS game. How hard could it be? Game #1: A planet exploration game. 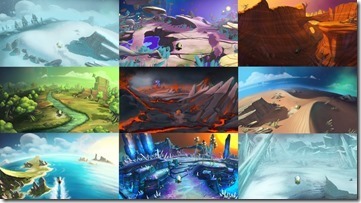 You could make an entire game around Star Control's planet exploration concept. Game #2: A galaxy exploration game. Space is big. In fact, some say the universe has hundreds, perhaps even thousands of stars. In Star Control's case, the galaxy has over ten-thousand planets out there. Game #4: The combat game. Super Melee. This is where you battle with other ships that have unique weapons and defenses. It's an action game. Game #5: It's an RPG. You are the captain. You have a ship. The ship is, ultimately, your character. Your allies are your party. You level up, get equipment to upgrade your ship so it's better and more interesting. It's a big project and one we're happy to tackle. But it won't be easy. The new Star Control game is the biggest game we've ever made. Its budget is bigger than the combined budgets of all the games we've released in the past few years. Stardock is the oldest independent game studio left in the industry and this game is a huge challenge for us budget-wise. When people get excited about this game or that game, it's easy to forget that most of those games are from publicly traded companies or are funded by a publicly traded company. The new Star Control is not. It's directly funded by the individual sales of our games by you guys. Star Control takes place in 2085. The humans are about to discover that the galaxy has been busy for a long long time. Star Control uses the Nitrous engine. For those of you not familiar with it, it's a next-generation 3D engine that can handle CGI like visuals in real-time. However, that comes at a price: Hardware. We are working hard to make sure Star Control will run on almost any system that supports DirectX 11, DirectX 12, or Vulkan. A year ago, we let in a tiny tiny number of people into the Founders program. We needed the thoughts and feedback of some die hard fans of the classic Star Control series that featured the Ur-Quan story line. It is not commonly known but the full name of Star Control 1 back in 1991 was Star Control: Famous Battles of the Ur-Quan conflict Volume IV. Star Control 1 and 2 deal with the Ur-Quan conflict. And there's also...Star Control 3. We've now had almost a year of listening to their thoughts and their ideas on all this. The biggest challenge we had was determining what is and isn't canon and how to have new adventures without overwriting what came before. Most people who get into the new Star Control will never have played or even heard of the classic series from the early 1990s. But for those, like me, who have, it has a very special place in our hearts. So the challenge has been, how do you support both groups? There is a single Star Control multiverse. Star Control 1 and 2, the Ur-Quan conflict epic, takes place on the universe we designate as Earth-UrQuan. Star Control 3, however, takes place on Earth-Crux. Earth-Crux is similar to Earth-UrQuan but is not the same universe. Thus, if Paul Reiche and Fred Ford, who today work for Activision working on Skylanders are able to return to their Ur-Quan stories, we presume they'd continue from the events in Earth-UrQuan (or whatever designation they'd prefer). The new Star Control prequel also takes place in its own universe. That doesn't mean it's a universe without the Spathi and Ur-Quan and so forth. But if you run into them, it won't be until at least 2122 (after this prequel takes place and only if Paul and Fred are involved in that story). For all players, the new Star Control prequel is a clean slate. For people who aren't familiar with all this lore, we still sell Star Control 1/2/3 from the 90s so you can get into that lore. This Fall we anticipate starting up Founders phase 2. This will be a much larger group that will continue to help provided feedback and ideas and this Winter begin testing out builds of the game with a select few being given the multiplayer Melee build to help us with multiplayer testing. More to come this Fall. This Fall we anticipate starting up Founders phase 2. I'm quite alright with an alternate reality reboot. It's a safe bet. What I really hope for is that Stardock manages to evoke the atmosphere of the original: playful, with some dark undercurrents. I'm sure you've considered it already, but why not start a kickstarter campaign? I personally would gladly pay $200 for this. I have always considered SC2 to be the best computer game ever made as purely a game. Civilization is the most important to the history of computer games, and the most influential... so if that is the question I'd say Civilization. But as purely "the best, most enthralling game" you've ever played, nothing comes close to SC2 in my book. I got it at the beginning of a weekend when it was only a few weeks old. I installed it that Friday night... and didn't go to sleep until sometime on Sunday after having finished it. I only left my chair a few times, and barely even ate anything the whole time. I literally couldn't stop playing it until I finished it. No other game has ever done anything like that too me before. It has always been my most memorable gaming experience. Thanks for the news, frogboy! I'm waiting this post since past year, or so. By the way, i realllllly wanna to thank you, and all you team for the work what u do. I'm so happy to recognize that this universe is back! Thanks for the new screenshots too. He's amazing for me! Nice to see an update. Any chance of getting more frequent updates or 'dev diaries'? Given the game is going to be released in about a year (not that far away in the grand scheme of things) it would be awesome to hear how things are shaping up. Fortnightly would be awesome but even monthly would be great. Screenshots of other things besides landscapes? In regards to the combat. Super melee is always good for a laugh (and I hope this game includes some form of 1v1) but is there any chance this game will branch out a bit and bring combat to a larger scale? Seems a bit of a waste to have such a capable engine and then just have two lonely ships fighting each other. It would be epic if this game could do justice to the idea that galactic scale empires are clashing. Games like Descent:Freespace (I'd use wing commander as the example but the fights never got big enough) show that it's possible to make the player a smaller part of a larger fight without the player feeling side-lined. A great individual performance can tip the balance or turn a would-be massacre into a respectable defeat but the player cant single-handedly lay waste to entire fleets. Why not have the story focused around a humanoid race thats unrelated to Earth-UrQuan? This way there is the potential to tie the two story arcs back together down the track. If you use earth but start in a separate 'universe' then any story that evolves on this game will be mutually exclusive to the Ur-Quan line and there is not much chance of having the two story arcs (new-earth & earth-ur quan) produced in parallel. Quick question about the second phase of the Founders program. Are people that got selected for the first phase, but didn't have the expendable cash at the time, or missed out due to the small intake and not getting back fast enough etc perhaps going to receive an email or invite to the second phase when it opens up, or will we have to go through a similar screening type deal like when the first phase was announced? We've considered this. But there is a general consensus that there's be enough people angry that the new game won't be including the aliens from the classic series that it could negative affect the perception of the game before it even has a chance to show off how good it is. What we are hoping to do is be able to demonstrate that this is a fantastic game in its own right that captures the spirit of the classic series and be able to show that the Star Control universe is big enough for a lot of fantastic stories. And the best way to do that, we hope, is to deliver that game. Those of you reading this thread, what do you think? It is, by far, our most concerning issue. There are a lot of people who think the Spathi and Orz ARE Star Control. Whereas, to us, Star Control is about being the captain going out on an adventure to explore strange worlds, deal with aliens, fight cool battles in a game that is held together by a great story. Yea, the second phase will be much more open to people joining in that the first phase. Agreed. There are a lot of people who think that. There are also a lot of people who refuse to leave their comfort zone. I'm as dedicated a fan as they come and I was tired of hearing that argument when the project was just getting off the ground and it will no doubt continue to haunt the new game going forward, unfortunately. For me, one of the most endearing aspects of SC2 was exactly as you say: exploring the unknown and discovering new species to talk with. The experience of finding something or someone previously undiscovered was a huge part of what made it intriguing, and I'd like to see a renewed focus on that in the franchise. I would be fine with not directly seeing any of the old Ur-Quan characters, however I don't feel the new story should pretend they don't exist within the framework of this new offshoot. Perhaps a good way of satisfying the those who refuse to let go would be in the form of easter eggs and subtle nods to the old canon. Something SC2 did a lot was to make vague references to a number of other species the player never has a chance to encounter. Sometimes these references are cryptic and mysterious (e.g. the lost races of the Sentient Milieu) while other times they are comical and silly (the Keel-Verezy and the *nnngn*) but I'm sure there's probably an opportunity to do this in reference to the Ur-Quan verse to keep the attention of those who refuse to accept the game without a higher degree of fan service. I enjoyed a lot of the dialog from SC3 (it was probably the best part of the game) however the tendency of many conversations to retread over previous material as exposition (aimed at new players who hadn't played SC2?) got to be a bit groanworthy and I do not want to see that happen again with old characters being hamfisted into a narrative created by different people strictly for fan service. That was just one of several reasons SC3 was a half-hearted followup and why I am completely in favor of a new adventure that brings back the feeling of not knowing who you're going to meet or where you're going to go. It's all about the story telling. If it is a good story, encompassing good "Star Control-like" aliens... then people will love it. Taking it to an extreme if George Lucas wrote it, with his first 3 movie level of storytelling... it would be a smash success, right? Or JMS, my personal sci-fi writing idol... it would be even better! There aren't a lot of people still playing games who would know Star Control. They are a critical audience, because "the 10%" has great influence in the gaming community, but much of the audience is not even familiar with the original races or story. And, really, it's not THAT hard of a story to equal. Certainly, the game atmosphere I have been seeing combined with the modern look and presentation are going to be light-years ahead of the original in every way. Star Control is the PERFECT format for storytelling, that is what makes it so great. Those multiple games in one you mentioned in a previous post, or was it in the Vault, are the whole reason why. In other adventure games you get a story, and some type of very basic structure of a game-like experience tying it together. But in Star Control you get little arcade games to play out the story in. Kind of like the Babylon 5 formula... show the debate in the "United Nations", then show the action relating to the politics in battle scenes. In Star Control you get the story, and then you play out that story in little mini arcade games. It is a far more immersive, and more fun, experience than any other adventure game because you feel much more a part of the story because you are "tactically" a part of the story. In the look, atmosphere, and sounds... you seem certainly doing much better than just good for my tastes. From what I have seen so far, which isn't even much, it seems to me like the story is all that is left. The lander game 1st, story 2nd, modular mothership 3rd, and space combat last... that's the order I would be concerned with. The lander game can make or break the whole game because players have to do it so often no matter how you slice it, and you seem to realize that from what you have said in the past. The modular ship thing has been done to death, it's a simple thing just about any gamer can do well, and yours looks very good for this game. 1v1 space combat is also pretty easy to deal with, and top down space combat is just inherently fun. So I would make sure the lander game is truly fun even after you have done it 50 times, and then it's all story, really. And "scenarios". In this game think more like us old school guys. They are not "quests", they are "scenarios". Don't send the player on a quest to a planet 80 times. Send them to the planet, then a "Commercial Platform" orbiting a planet, then maybe the base at a planet, an overlooked outpost on a moon where the "people" there are far less serious than the others of their kind being so isolated from them, etc. Planets of space faring species aren't just sitting there by themselves... they are surrounded by a "defense and civilian grid" of various bases, defenses, and facilities. Use "Battlestations" where a player may not encounter a ship, but must "peel the onion" of it's defenses. Give the worlds that are supposed to have populations some type of "defense grid" around the planet. Even if it is just a base, a commercial platform (generic name for any civilian facility you choose to name it), a minefield, some defense satellites, and a "Big Gun" on a moon. Or something like that. Then there is a LOT more variety in the quests... that you can actually make more like tactical "scenarios" like an old Avalon Hill or TFG game. This also, VASTLY improves the storytelling, with this wider variety of things to build those scenarios out of. The lander game and the story seem like the most important things that have to be great for this to be the blockbuster it clearly could be. The lander game is the lander game, whatever it is you are doing with that, I can't tell too much about it from what I have seen. But "scenario" quests will go a long way to improving immersion, adding variety to the quests, and improving the story through the more diverse elements to use in the telling of the story... the specifics of the "quests" and greater storylines that can also impact. Not upset that the old SC2 races aren't in this one - there are very good reasons for that. Totally agree that it's possible to capture all of the great things about SC without those races. Would it be sacrilegious to have Vasari, TEC and Advent in the game as a crossover/ tie-in kind of way? Is there a way to get a email when the founders program opens up again? Has your team come to a decision as to whether or not to support the Macintosh? The thing about star control is, once you undock from your home base station you can already feel the excitement, as you go further and further towards leaving your solar system to hyperspace the senses heighten and the excitement factor kicks into high gear once you're in hyperspace ! You are the Captain, traveling in your ship through Space, the sound the visuals for that time really immersed you into the game's reality, it was awesome ! I loved every aspect of the game back then just as it was it was perfect !, i liked auto pilot for long journeys to a constellation however it was never boring ! Watching your ship move in hyperspace knowing you are venturing faaaaar from home, eyeing your fuel, watching for enemies approaching pondering on whether to engage them or try and outrun them (if your ship was upgraded enough) and the excitement of traveling deeper and deeper into space about to explore an ancient distant galaxy is True Adventure ! ! ! ! the planets, the ships the combat the aliens the technology the universe the stars, the travel, the dangers, the humor i cannot say this sentence with any punctuation as i want to say all these words at once ! That's how exciting this game was ! It's very good to know that an experienced team is behind this masterpiece, if they don't take away what makes this game unique and super intriguing/addictive then people i say Wer'e in for an exciting exhilarating experience ! ! ! ! No waste whatsoever, star control's one on one battles are second to none ! ! i would not change ONE thing about it, bringing in more ships is going to make it feel like an rts game and there are too many of those, instead one on one puts YOU into the jumpseat, and you can focus on the excitement of using your reflexes and quick thinking to outmaneuver and destroy the enemy, all attention on 1 on 1 with the planet in the middle, your ship with unique abilities and if you use it wisely you may win the battle ! ! ! I'm getting psyched just thinking about it and the quest of the game ! ! I asked about a sign-up list a while back and was told to just keep an eye on the boards here. I sometimes need to go a week or more with no time for games or typing about games, so I'm hoping the window will be generous if I have funds to participate when it opens. The only part i'd like to add a touch of rts is on the planets wrt scouting, a suv ship sent from your ship orbiting the planet from interest should land on the planet's surface, deploy and you should be able to build a harverster and a caryall to move your harverster around but you fly the caryall realtime and you control the harvester realtime, return to base to fill up your silos , repair your caryalls and harvesters on a repair bay, and then all launched back to your ship in orbit once done. I Agree with You and Awkbird entirely. Star control is Star control, regardless of the different races, meeting new and different races in fact would add to the excitement ! Yes i love the old Races too, they can be put into a future release no need to have them all in right now. The need for 1v1 combat and hyper-melee will always be there and I dare say it would be a crime to call it StarControl without it. I first played Star Control 2 many many years ago when I got it on a PC Gamer companion CD. And I fell in love with it. The exploration, the race interactions, the large universe, it all came together form this awesome experience. Then a couple years ago I played Starflight and loved it almost as much (mostly losing points to some clunky parts of the interface). So the fact that this won't have the classic races is not an issue; the gameplay style is the most important thing. I'm not "angry," but I think it would be awkward to have a Star Control game without the races. Your prequel solution works, except that whatever races you do introduce in the prequel need to somehow disappear and become forgotten by the start of the Ur-Quan timeline. Alternatively, if you just say it's a different multiverse with completely different aliens, then I honestly don't think you needed to purchase the license to Star Control. Stardock has already proven it can make great new IP with a compelling spin another game (i.e. GalCiv), I feel you could have done the same with Star Control and saved yourselves a few bucks. I still pull out Star Control 2 and play it. I have ended the doctrinal conflict so many times, I've lost count. Its not that Star Control is the races, its just that they are so well done and believable without being 1000 variations of humans. They also don't exhaust you with the details. I still have zero idea who the ORZ really are. I can make some educated guesses. But what they really are are interesting. While it would be fun to see the Chenjesu uplift the humans into the Ur-quan war, I already know that story and how it ends. I would absolutely love a new story and aliens to befriend or make enemies. Toys for Bob had the advantage they built the super melee game first, sold it. Then they added the Adventure on top. You are going for the full Monty so props to you. All of your games are awesome and the universes/lore are great. The one thing I have missed is having a narrative, to see how you tell the story. I am really looking forward to this. With your track record I can't imagine you can fail. Biggest reason I keep playing Star Control 2 over and over as it will play on anything. I have it on my Desktop, Laptop, PSP, and Phone. I enjoy games like Witcher 3 that look amazing but my schedule keeps me away from my desktop so that I can never finish it. I think you have found the best middle ground I have seen when a series gets a reboot. When you use the name, people immediately have a certain expectation. As long as you can create a compelling and interesting world, I think we will want to play your story. Plus as they say, "If you build it, they will come." Maybe this will finally see Fred and Paul reinvest in this. I think you could do a great story with the original Star Control races, and that is the safer way to go. But I think it is actually better to make your own races. That gives you much more freedom in what story you can tell. And it really is all about the story we are talking about here. If they create and even better story, with how for off the scale better looking and more immersive this version will be... People won't forget about the Star Control story as I was about to type, because it is a truly great classic story. But they also won't be comparing Stardock's story to it anymore, either. They will both stand on their own and people will like both. They have a LOT of advantages over a game made in the early 1990's for 286's EGA graphics cards. To say the least. If the story and game are even equal... it will blow the original away!